Photo courtesy of Purdue Athletics. BOSTON - Jacquil Taylor’s future can be summed up in three words: To be continued. The Purdue redshirt-junior has seen his career stop and start multiple times already in West Lafayette, but continues to persevere and keep a positive outlook on the universe. Before joining the Boilermakers, the Cambridge native starred at Beaver Country Day School in Chestnut Hill, winning a pair of NEPSAC Class B championships. However, Taylor lost his junior year to a foot injury and has battled through injuries in two of his seasons in West Lafayette. This weekend, Taylor will take to the court at the TD Garden, trying to help guide the Boilermakers to their first Final Four since 1980. 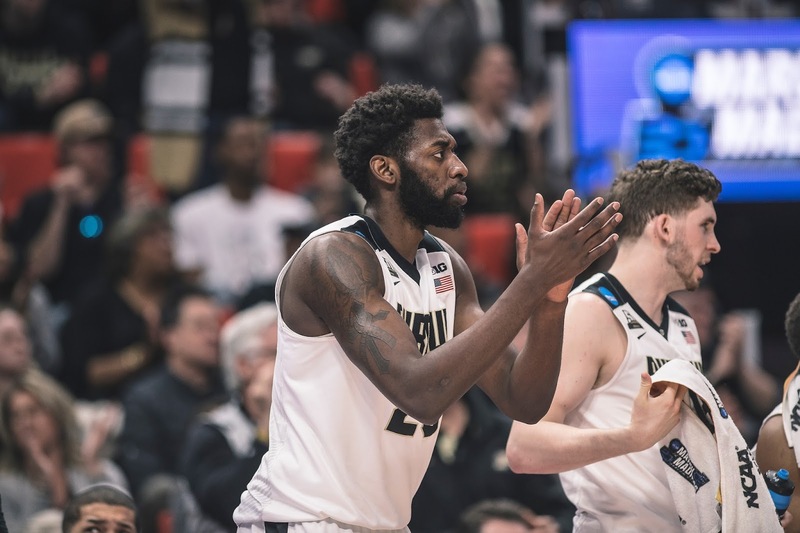 It would take two wins on the famed Garden floor to get Purdue there, and Taylor, who has mostly served as a reserve throughout his career, could potentially play a large role in the two biggest Purdue basketball games in over 35 years. Taylor will be asked to help fill in the hole left behind by injured senior center Isaac Haas, who fractured his elbow in Purdue's tournament-opening win over Cal State Fullerton. 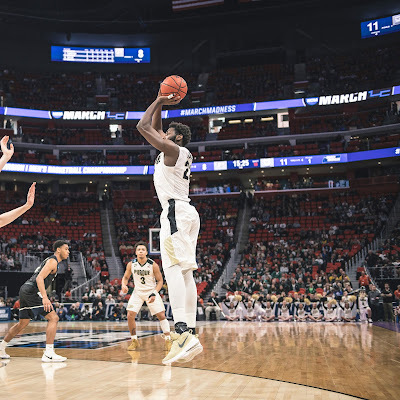 After playing extensive minutes in Purdue's Round of 32 win against in-state rival Butler, Taylor expects to once again have an expanded role in the Boilermakers' Sweet 16 contest against Texas Tech. On top of the pressure of the actual game, the local product also expects to have nearly 20 family members in attendance tonight. Taylor attempts a jump shot in Purdue's Round of 32 win against Butler last Sunday. Photo courtesy of Purdue Athletics. While Taylor’s present and immediate-future could feature an NCAA championship ring, the past that helped mold him as a man is a tale in itself. One of eight kids, Taylor’s basketball background started at home playing against his older brother Maurice. A scholarship basketball player at North Carolina A&T before transferring to Niagara, Maurice gave Jacquil his first lessons on the court. Jacquil continued to improve as he got older, and after a strong freshman year at Cambridge Rindge & Latin, Taylor transferred to Beaver Country Day to play for coach Juan Figueroa. In his first season at Beaver, as a sophomore, Taylor averaged 15.1 points, 8.3 rebounds and 3.2 blocks a game, en route to leading BCD to an undefeated season. Taylor’s character also developed alongside his basketball skill while at Beaver. Always the first to finish sprints, Taylor developed into a team leader and led the Beavers to another Class B title as a senior. Beyond his skill, which was always improving thanks to Taylor’s work ethic and attitude, his character off the court left a mark on Figueroa. A strong student, with a talent for filmmaking, Taylor has made a series of videos on YouTube. He cites Spike Lee as his favorite director. Taylor and his Purdue teammates will take on Texas Tech in the Sweet 16 tonight at the TD Garden. Tip is scheduled for 9:57 pm.